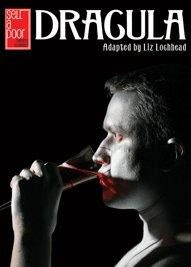 Sell A Door Theatre Company are currently touring their production of Liz Lochhead's adaptation of "Dracula" around Scotland before a month long residence at the Greenwich Playhouse in London. And with a stop at Stirling's Albert Halls on 31st October, what better way to spend Halloween. Louis J Parker is excellent at making his Count menacing and monstrous, but despite an appearance that wouldn't look out of place in 'True Blood', 'Twilight' etc. any sense of magnetism or charisma was largely absent. When this Dracula exerts his power over women it appears solely down to his supernatural powers. However, the moments when he bites his victims are exquisitely realised - wonderfully memorable moments of theatre. The first act is a little on the slow side as the characters are set up but the post-interval introduction of Alexander Pritchett's Van Helsing immediately brings an energy and sense of urgency to the show. It's a really strong performance and carries much of the second act, but it emphasises the problems with the choices made for Dracula. Rather than our vampire hunter battling against all odds, it would be a foolish man who would bet against this Van Helsing in a battle with this Dracula. Laura Blackmore and Daisy Burns impress as Mina and Lucy, with Mina's transformation from prim propriety to wild abandon particularly well realised. Madness on stage is often taken to hysterical extremes but Kieran Hennigan's portrayal of Renfield, institutionalised after his encounter with Dracula, is beautifully measured. Sophie Holland deftly delivers much of Lochhead's pointed social commentry as maid, Florrie, while Matthew Grace makes Harker's choices and reactions believable, but for such a central character he actually doesn't have a great deal to work with. The strong ensemble is completed by Ellis J Wells' Doctor Seward and Louise Ann Munro's nurse who both have some fine moments, but due to their characters' fast paced dialogue at times their clarity was hampered by the cavernous nature of the venue, vast stage and expanse between the stage and the audience. Indeed all the cast at times found themselves competing with an overly loud, if admittedly atmospheric, soundtrack. Despite some flaws, this is a fine production and the audience really responded to it - in fact the biggest mistake I saw on stage last night was the cast's failure to recognise that the audience was demanding a second curtain call. When the audience keeps clapping as long as we did and people are whistling and cheering, it's a shame not to oblige them. Dracula is now nearing the end of an extensive tour but visits Greenock and Tamworth this week before arriving in London on 9th November.